Learn how to read the widgets on a credit report, and how to interact with them. All credit reports on CreditorWatch include a summary of information about the data represented on the page. This information should be used as an easy way to glance over to find any relevant issues that could be worth looking at. In the example below, you can see what widget information is available on most reports. 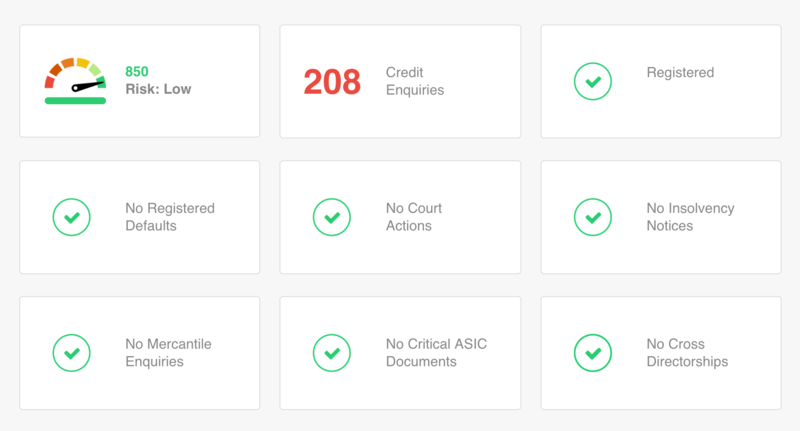 If you have integrated with a supported accounting package such as Xero or MYOB, another row of widgets will appear on credit reports that exist within your accounting package and have a valid ABN or ACN associated with them. All the widgets are clickable if more information is available. When looking at the information represented in the summary widgets, a report has two states which are either positive (represented with a green tick) or a potential negative state (represented with numbered data) both states have been represented below. The example shown shows when no registered defaults are found and when registered defaults are found, to highlight the difference of positive and negative states. Each of these states are shown below for illustrative purposes.